Also on Griffin Bay were about five common loons, 20 or so surf scoters, and a single horned grebe. 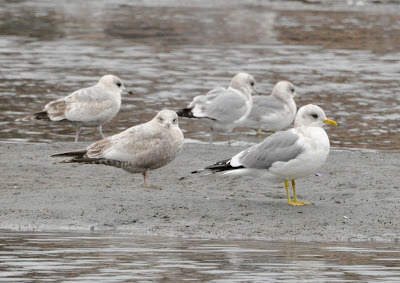 Among all the glaucous-winged gulls I found three western gulls. Through the woods on my way back to the car I spotted a pair of golden-crowned kinglets, a single golden-crowned sparrow, some house finches, and a trio of robins. Cattle Point was bustling with activity. 40+ glaucous-winged gulls, 65 pelagic cormorants, five Canada geese, and a smattering of double-crested cormorants were hanging out on Goose Island. Red-winged blackbirds, dark-eyed juncos, house sparrows, and house finches were all perched in the trees along the shoreline. I was surprised to see so many passerines out in the open with the heavy breeze. 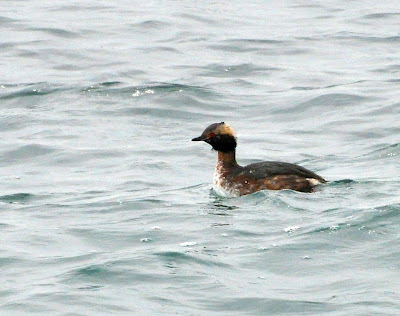 In Cattle Pass itself 15 harlequin ducks, two pigeon guillemots, and half a dozen red-necked grebes. There were also two flocks of surf scoters, and among those two flocks I counted no fewer than 30 horned grebes! I've never seen that many in one place. On the rocks below the lighthouse were a couple of black oystercatchers (another shorebird for the list! 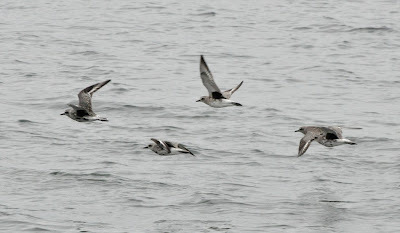 ), and a fly-by from six rhinoceros auklets completed the bird list for Cattle Point. I swung by False Bay, but there were no sandpipers there. A great blue heron was fishing out in the tidal flats, and the expected large flock of mew gulls were hanging out on their gravel spit. A couple of them were foot paddling in the mud and feeding. There were also flocks of northern pintail and green-winged teal - smaller than the groups seen there in the depths of winter, but still quite a few of them. I heard or saw four different hummingbirds throughout the day, but was never able to get any of them in binoculars to see if it might be my first rufous hummingbird of the year. Still, I ended the day with 46 species on the list, a nice total! I'm glad I got out yesterday, too, because it has again been raining alllll day today! Wow, that was a busy day.